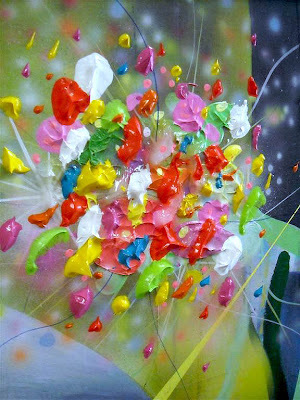 This is the 1st in an ongoing series of interviews I will be conducting with a wide cross spectrum of art collectors. 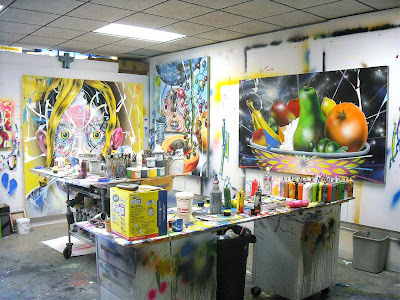 From your every day folk to rock stars and celebrities, these interviews will offer a glimpse into what initially got them into the new contemporary genre (ie: pop surrealism, low brow, graffiti, street art, etc.) in the 1st place and what fuels them to collect. 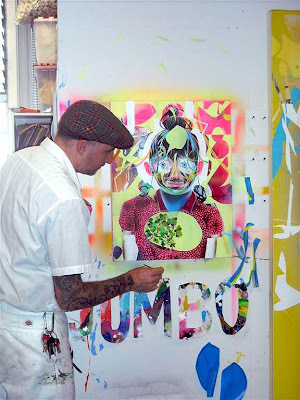 First up is Southern California collector and artist John Purlia. 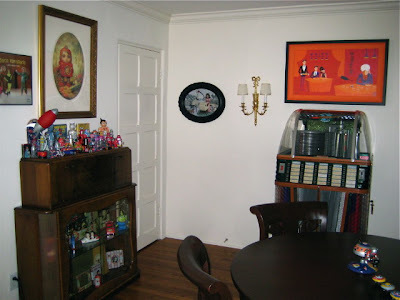 Pictured throughout the interview are selected works from John’s amazing collection as well as some shots of the works living in their new surroundings. Like a lot of people, I think the history of my interest in art can be broken down into three phases: Awareness Phase, Influence Phase, Collector Phase. In my case, the Awareness Phase can be directly tracked to growing up in a home with an artist mother, and two art major sisters. 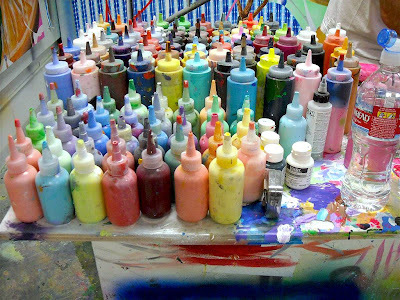 Art projects were in abundance. Having grown up in the age of LP records and those big, beautiful 12″ album covers, the Influences Phase captures years and years of buying records and absorbing every visual square inch of their glorious covers. I papered the walls of my college dorm rooms with enormous posters of album covers; not necessarily because of the music within, but because of the striking visual impact of a particular image. 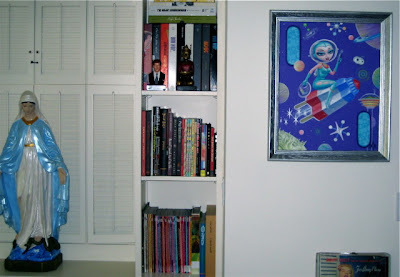 It’s only been within the past 10 years or so that I’ve jumped headlong into the Collector Phase of life’s circle of art interest, which was triggered by a booth at Comic Con in 1999 when I first saw the work of Mark Ryden. I was totally hooked by a print of Princess Sputnik, and ended up buying two of the limited edition prints from The Meat Show. 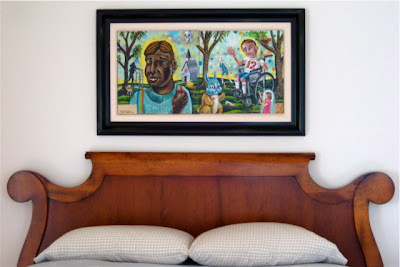 My grandfather was a true undiscovered folk artist, who painted, sculpted and created all kinds of interesting things for his own use and pleasure. One of my greatest possessions is a tiny painting he made titled I Was Born Naked. My mom painted and fired up ceramics, and both of my sisters created all kinds of drawings and paintings. My oldest sister is becoming quite the connoisseur of hand crafted art on Etsy. 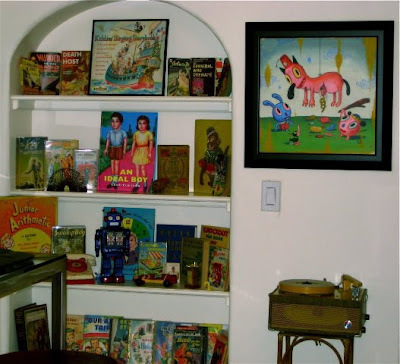 Yes, I’m always on the lookout for old records, toys, vintage books, radios, record players, robots, or other interesting things that maintain a certain timeless aesthetic. 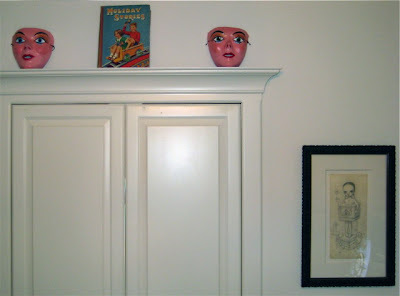 My house is filled with various collections that I live with, much in the same way I live with the art on my walls. 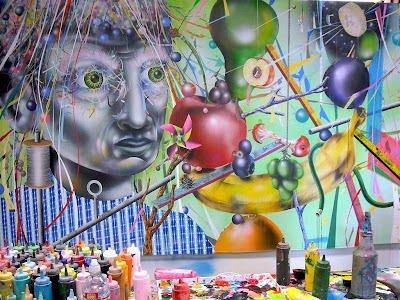 With artists like Mark Ryden, Todd Schorr, Camille Rose Garcia, Shepard Fairey and The Clayton Brothers all having major retrospective museum shows in the past year or two, the future is definitely wide open for this our little bubble of the art world. 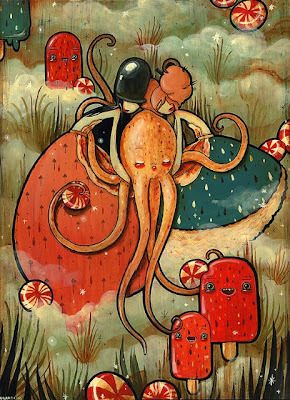 Where do you see this genre of art (new contemporary, urban contemporary, pop surrealism, outsider, lowbrow, etc) going over the next 5-10 years? I think we’re just coming out of a period wherein the art scene popularized by the Rydens, Schorrs and Claytons has been diluted, to some degree, by a lot of recycling of themes, styles and ideas. One day the world woke up and realized that something pretty cool was going on in this genre of art, which was both a blessing and a curse. On the one hand, some amazingly talented artists began to gain broader recognition. 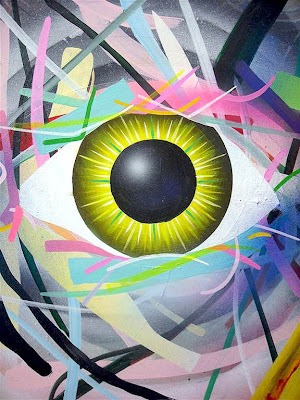 Unfortunately, popularity sometimes breeds poor imitation, and for a while there you saw a lot of sub par repetition, as new artists entered the scene without either the skill or freshness of voice of, say, Camille Rose Garcia or Shepard Fairey. Hopefully, the next 5-10 years will see a maturation of the genre to kind of weed out the heavy recycling we’ve seen over the past couple of years. While imitation is inevitable, it tends to weigh down the development of an emerging art movement, which otherwise needs some space to grow in new directions. My first prints were the aforementioned Ryden IRIS prints of Princess Sputnik (shown above) and The Debutante at Comic Con. Since then, I’ve concentrated my collection almost exclusively on original paintings and drawings. 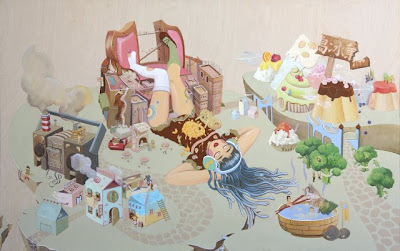 The first painting I almost acquired was a great Aaron Marshall piece I saw one afternoon at La Luz de Jesus while I was shopping with friends. It was the only piece still remaining from his first solo show and I thought it was the coolest thing ever! But the price (over $1000) at the time seemed like such an extravagance! I regretfully left the gallery and wandered up the street, where I purchased a really fun mixed media piece by Elizabeth Hoffman titled Pay, which now hangs in my library. When I returned home to San Diego, the Aaron Marshall piece continued to pester me, and it wasn’t long before Irrational Desire won the easy battle over Common Sense. I called the gallery to then discover that I was a day late and the piece was gone. 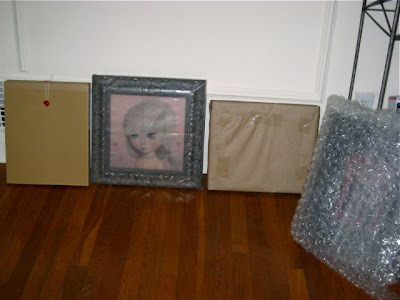 Hence, I learned my first painful lesson of collecting art: Reverse buyer’s remorse is to be avoided at all costs. You see it, you like it, buy it. Just one, a very nice Tibetan Buddha from the 1930s that stands in a dining room window that looks out into my back garden. 2009 has been a busy year for new art, and in the first half of the year I’ve made a number of exciting acquisitions: a drawing from Mark Ryden’s “Snow Yak” show in Tokyo (shown towards end of this post), a new Ana Bagayan painting, and Nouar’s happy-happy “Lemonade Parade” (also shown below) from her New York show all immediately come to mind. 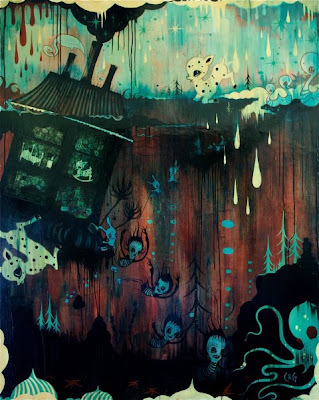 The biggest score, though, was one that I thought had gotten away – “There In Time” by Brandi Milne (shown above), which had already sold by the time I made it up to LA to see her recent show at Thinkspace. “There In Time” immediately caught my eye as the strongest piece in the show. I really loved the composition, the color, and the feeling of comfort present in the piece. It was, of course, already sold, so I spent 30 minutes narrowing down an alternate selection from several other pieces I really liked. Still, I kept drifting back to that one piece… When the show closed, it turned out that the original buyer backed out on the purchase, and the gallery luckily remembered the interest I’d shown in the piece. Voila! I had a second painting from the show, including the one I wanted in the first place! Perhaps this was Karma’s way of cutting me a break so many years after losing that Aaron Marshall piece! This is a really difficult question! And in order to properly provide an answer I just now took a room-to-room walk throughout my house looking at all the paintings in my collection. It’s hard to pick a favorite in each room, let alone the entire collection. But if I were inclined to have some sort of single elimination, head-to-head March Madness style Tournament of Fine Art… I think the winner would be “Dearly Departed” by Ana Bagayan (shown at the start of this post). 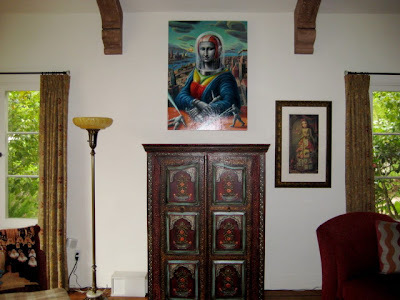 I just love that painting, and it hangs in my master bedroom where I see it everyday. It’s from Ana’s first solo show, painted while she was finishing up school art Art Center in Pasadena, and I think it’s a very significant piece. In person, it’s really gorgeous. Best score to date collecting wise? 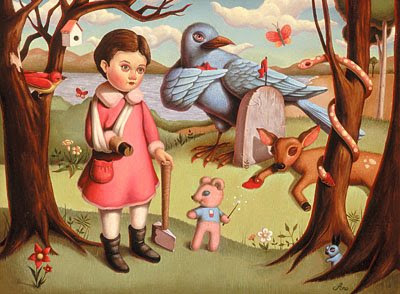 My best score to date has to be “Atlas” by Mark Ryden (shown above), an illustration piece not a lot of people are familiar with, as it was one of the paintings from Mark’s 2001 “Amalgamation” exhibit at Outre Gallery in Melbourne. I managed to get on the waiting list very, very early, and had to wait out only one other collector before securing the piece. 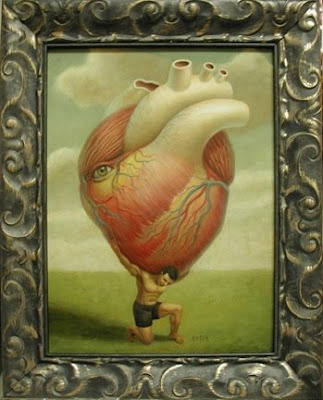 If you haven’t seen it, it’s an 11×14″ color oil of Atlas holding a giant human heart on his back. The piece is the centerpiece of my bedroom, and to this day I have other people who were farther down the waiting list contacting me asking if I’d be willing to sell. What inspired you to share your collection on-line for all to see? Really enjoy your site. Thanks! I feel very fortunate to be in a position to fill my everyday life with art, and I see it almost as a responsibility to share images from my collection on the web. I’ve always enjoyed visiting museums, and when I see great pieces of art standing behind velvet ropes and bulletproof glass, I can’t help but wonder about the painting’s provenance before it found its way into the public view. I mean, it was owned by someone and likely held a place of honor in a living room or a dining room, hidden away from public view, only to be enjoyed by the friends and family of the owner. These same wonders occur to me today when I see new pieces in a gallery that hang on public display for a month or so for all to enjoy, until that closing day when the exhibit is dispersed to private collectors here and there and there. 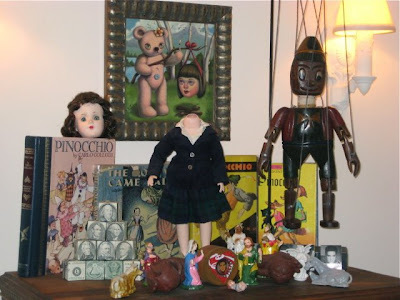 I like to view the sharing of my collection on the web as hosting a virtual museum. The original pieces may be locked away, but the whimsy and joy those pieces bring can be shared across the globe with anyone who points a browser at my web site. It sort of gives the art a public life in perpetuity, beyond the original gallery run. It gives me great satisfaction to connect others with the art I’ve collected in this way that a museum connects with its patrons. Probably Todd Schor. I really like the detail in Todd’s work, but the timing of his shows have never quite worked out with my art budget. This year, for example, there were a pair of paintings available to me during his recent show at Merry Karnowsky… but after I’d already bought 5 or 6 pieces over a 3 month time period. His previous show took place about the same time that I bought my house ‹ and I didn’t think I’d be able to afford my water bill, let alone my mortgage. I had visions of pushing around all of this great art in a giant shopping cart while my home was being taken away by creditors (I’m paranoid that way). I’d like to have Jan Van Eyck’s “Ghent Altarpiece” ‹ especially since one of the original panels was stolen 75 years ago. If I had it, it would no longer be stolen, though I fear I’d have no room large enough in my home to actually put it on display! I’d build a tasteful new room to display the work if the Cathedral of St. Bavon would be so kind as to allow me to take it off their hands. I can’t imagine a time that I would stop supporting the arts. Collecting, for me, satisfies the desire to experience the thrill of new discovery. Experiencing the work of a previously undiscovered talent ‹ whether it be painting, music, or writing ‹ is terribly intoxicating! The anticipation of “what else they have done or might do” is energizing, exciting, and always something to look forward to. So as long as there are new artists connecting with the creative part of my soul, I’ll be in the game. Now, as to how one manages the physical articles as collections grow… good question! Luckily, I do have some blank wall space left to fill. After that… I wish I had a clever answer! I suppose I’ll have to rotate work in and out of circulation, or loan pieces out for museum shows and retrospectives, as I’ve done frequently in the past. 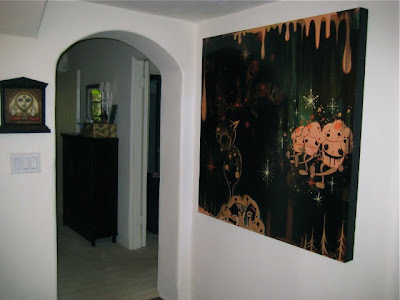 Or maybe I’ll win the lottery and expand my house ‹ more walls equals more art, yes? One of my recent favorites is Jeni Yang (shown above), who has created her own fun little world of feline sandwiches, vegetable trees and people packaged in cellophane bags like fine candies. She’s a smart and talented artist, and I really love her work! 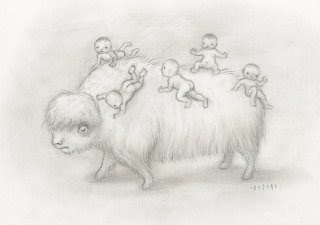 “Yak With Babies” – Mark Ryden + “Percy’s Unlucky Day” — Ana Bagayan + “Lucky You” — Brandi Milne + “The Music Box Song Club” — Femke Hiemstra… all waiting to be hung. 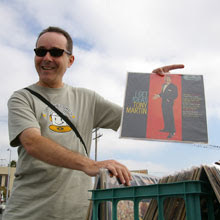 Look for more collector interviews to be posted here every other week or so moving ahead. I’ve over a dozen interviews already in the works and many more to follow. Some pretty amazing collectors have agreed to let me pick their brains and let me into their homes. I’m honored to be presenting this awesome series of interviews for all to enjoy and learn from. Had a chance to visit the studio of the Clayton Brothers a couple weeks back as they prepared for their first major show in Los Angeles in six years. This will be their first major collection of works in Los Angeles since they rocked La Luz De Jesus back in 2003 with their epic ‘Six Foot Eleven’ show. I still remember how blown away I was by that show. Simply epic in every sense of the word. For those that missed that one, do all you can to make it to Santa Monica this Saturday. 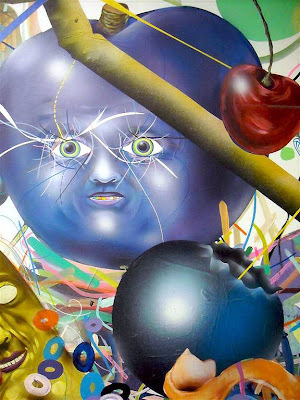 ‘Jumbo Fruit’ will open this Saturday, July 18th at both of Patrick Painter‘s galleries within Bergamot Station over in Santa Monica. Very ambitious and as you can see below, Rob and Christian have more than stepped up the challenge. I can not wait to see these works all finished and hanging in all their glory this Saturday. A big thanks to Rob & Christian for having me out. The Clayton Brothers work together closely to construct objects that are both narrative and deeply personal in nature. Front and center are the unique people, animals, and places that occupy the outskirts of the American psyche. 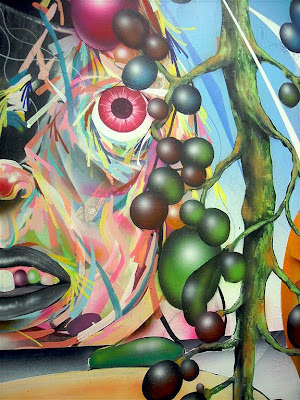 These works are created in an obsessively rich, cartoon-inspired manner and often incorporate related audio elements. They’ve a rich history and I highly recommend picking up any of their books. 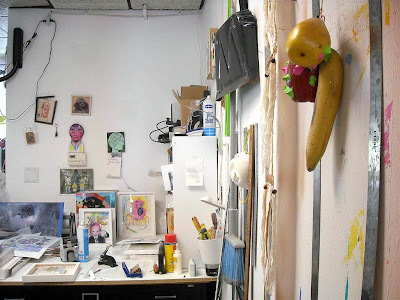 Enjoy the pictures below that offer a glimpse into the creative process behind the works that will make up their ‘Jumbo Fruit’ exhibit(s) opening this Saturday. 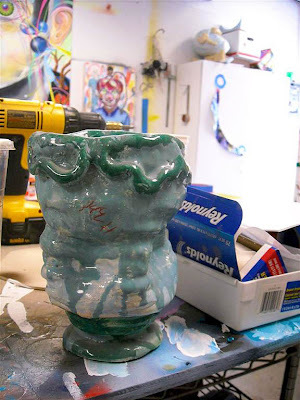 Above, view a picture of the pinch pot that was the initial point of inspiration for this show, found at a thrift shop, it’s now a cherished item in their studio. Sometimes the simplest things can be the catalyst for amazing works. 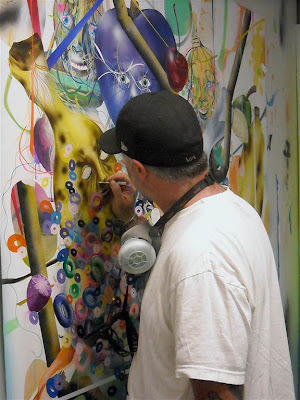 Rob Clayton at work in the studio. The big one in progress… this one is going to blow minds this Saturday. 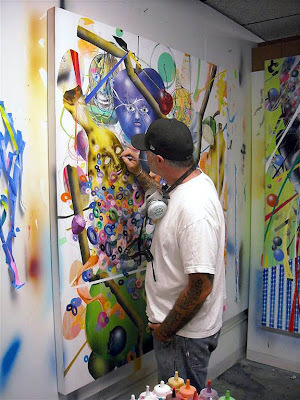 Christian Clayton at work in the studio. 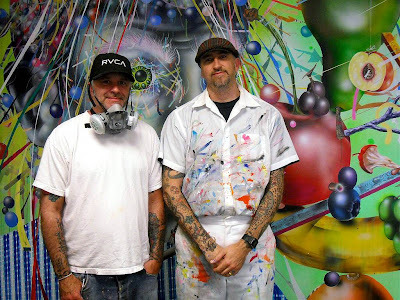 The Madison Museum of Contemporary Art will present the first major museum exhibition dedicated to the bold, colorful drawings, paintings, and sculptures of Rob and Christian Clayton.